The aim of this international volunteer project is to bring together people of different cultures to work toward a common goal and promote peace, tolerance and understanding. The volunteers’ main task will be renovating ancient sites near the Church of the Nativity in Bethlehem which marks the site of Christ’s birthplace. The project takes place at Christmas time, and the volunteers will assist the Bethlehem municipality to prepare for the festive season. The group will help with painting, distributing flyers to tourists, and putting up decoration to beautify the city. 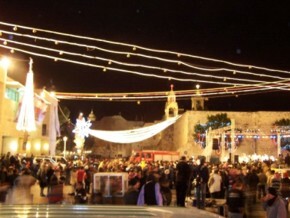 The volunteers will also have the opportunity to celebrate Christmas with the Palestinian people. The project also provides intercultural learning experience with a focus on Palestinian culture. The participants will visit refugee camps in Bethlehem, will tour places of interest, will attend lectures, meet local politicians, and most importantly, spend time with and get to know local people.